Road cyclists have a lot of choices to make with our equipment. In general, our choices can be as individual as we are. I have more than one road bike. This works well when one is in the shop; I always have a bike to ride. Three days ago, I took my bikes into the shop. The one I normally ride needed service, and the other needed some fit upgrades. The bike I usually ride stayed at the shop, and the backup bike has gearing better suited to climbing, so I had a great opportunity to see how different gearing feels. My Orbea Onix. This bike has a compact double chainring, and a relatively tall cassette on the back. That makes it a good bike to use when I have to ride up difficult climbs. My primary bike is a Cannondale CAAD 12, with Mid Compact (52 tooth outer and 36 tooth inner) Chainrings, and the gearing in back is an 11-28 cassette with 11 cogs. My backup bike is an Orbea Onix, with a Compact (50 tooth outer and 34 tooth inner) in front and 12-30 10 speed cassette in back. I had the fit metrics on the Orbea matched to the CAAD 12. It gave me a chance to feel what it’s like to ride a familiar course on a bike that was set up for climbing. I tried a ride that had climbs that would require me to use the small chainring. I had weather to stay ahead of, so I set out heading uphill from home on familiar roads at a strong pace. The first difference that I noticed was my pedaling cadence had to change. I had to spin faster to hold the same speed I normally do. That isn’t necessarily a problem. Every rider has their own preferred cadence. Some will prefer turning the cranks at a higher cadence, some slower. I do most of my riding in the big chainring, and while the difference between 52 teeth and 50 teeth isn’t much, you can clearly feel the difference. I compensated for this by shifting down to smaller gears on the cassette in back. The next difference I felt was acceleration. I’m a big rider, and I apply a lot of power in my riding style. The difference in acceleration out of a corner or up a short grade is noticeable between a 52 tooth chainring and a 50 tooth chainring. The top end speed on the 50 is clearly less. Cruising at speed with a 52 tooth chainring feels different to me; I prefer it. On some climbs where I usually shift down to the small ring on the primary bike, I rode in the 50 tooth chainring on the backup bike. Since the rear cassette is also taller (the biggest gear at the back is 30 as opposed to 28) the difference was enough to make the climbs feel different. It’s hard to explain how those small changes make you feel; but on one particular climb, I was cross chained on the 50-30 combination for perhaps 300 yards on a hill where I might have used my small ring on my primary bike, and I felt that the compact chainring had the advantage on that section. There was one climb in particular that I was looking forward to. It’s a relatively long climb with steep sections, and I can climb it just fine in the tallest gear combination on my primary bike (36-28). I knew that having the lower gear ratio of 34-30 would make that climb easier. When I climbed it in the 34-30 combination, it didn’t wear on my legs as much, and I was moving more slowly. The cadence I kept was comfortable and the climb felt easier. To me, gearing differences speak to riding style. Most of the riding that I do isn’t on steep climbs. I’m strong enough to ride rolling terrain and even some hard climbs with a Mid compact (52-36) in front and an 11-28 cassette in back. Having the compact (50-34) chainrings and taller cassette options in back is useful for managing long or challenging climbs. It will certainly give you some peace of mind if you’re not a confident climber. When I know that I’ll be on long or challenging climbs, that tall gearing feels good. 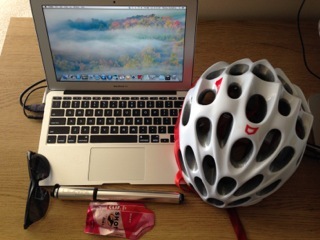 For the bulk of my riding, my primary bike’s gear setup is an excellent combination. Some riders worry more about the steep climbs than the majority of their riding. For them, compact gearing is probably a better choice. If you’re new to road cycling and you’re buying your first real road bicycle, I’d say go for the compact gearing. Those tall gears won’t make a big difference to you on the flat terrain you’ll ride most of the time, but they’re useful when you’re tired or find yourself on a hard climb. You will become accustomed to the setup you choose. I don’t recommend triple chainrings, because they can be tricky to adjust and keep in alignment. It’s a rare rider who actually NEEDS a triple. I had a triple on my first road bike I bought years ago, and the smallest chainring was almost never needed. Unless you live in the mountains, a compact double is an excellent choice. If you have some riding experience, ride often with others, and know your style, you may find that a Mid Compact gearing setup is a great fit for the way you ride. Very often, gearing is a matter of confidence. I found that making a comparison of the two gearing setups was very useful. I think that when I get my primary bike back, I’ll still use the backup bike occasionally and keep in touch with the differences. Since the fit for both bikes is now identical, I’ll keep the backup bike prepared for rides that include tougher climbs when a mechanical advantage on the climbs is a good idea! This entry was posted in Cycling, Front Page on July 22, 2018 by kitefencer.